Do you decorate your home for Fourth of July? Generally, I add a few simple touches of red, white, and blue to my kitchen and great room. American flags are key to my decor inside and out. Then I pull out my Longaberger Baskets with red and blue accents, along with like-colored pottery. It’s a fairly uncomplicated look, but evokes the spirit of patriotism for this fun, but very important national holiday. This year, I went all out in the sunroom. It might have something to do with the One Day, Three Ways :: Restyled Space Challenge. Yes, the one where seven fabulously creative bloggers took a week to reveal their transformed spaces and then invited the likes of you and me to link up our spaces too. I thought it was a fabulous idea! After all, I have a sunroom that I’ve been playing around with since Christmas. It’s gone through several seasonal changes here and here and here and here. And then last week I tweaked it again for the One Room, Three Ways Style Challenge. And that should have been that. Because seriously, I was in love with the look. Totally. It felt so cool and refreshing on these uber warm summer days. But, of course I couldn’t stop there. Nope. I checked the calendar and counted the days and oh. my. goodness!! It’s almost the Fourth of July!! Really…where has the summer gone. I thought it had just gotten here and I was just starting to enjoy it, and then all the end of summer sales have begun. What’s with those retailers? Why can’t they stay in the moment more? It’s a good thing I shop my house these days….because I certainly am not ready to start buying school supplies and journals and new pens, just yet. Nope. I want to revel in this amazing holiday. I want to light sparklers. Do you love to light them and dance around the yard too? And watch fireworks….and fireflies. And hang with friends around a camp fire and roast sweet delights. And sit on the porch, with a few candles burning in my Mason jars, and look at the stars. 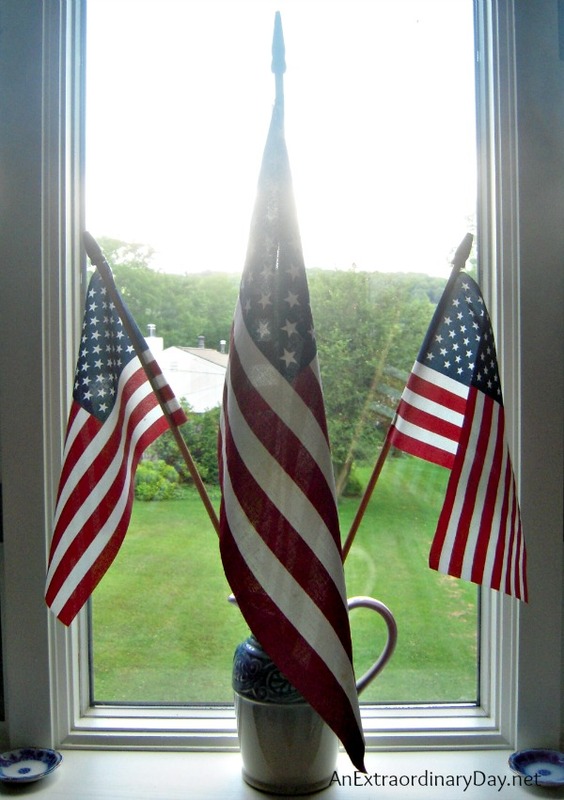 And decorate my sunroom for our country’s holiday of holidays….Independence Day. I want to wave the flag….or maybe ten or twenty flags. I want to celebrate freedom. And liberty. And justice for all. And I want to eat blueberries for breakfast and sweet cherries for lunch and enjoy homemade ice cream in the evening. And flash my made-in-America baskets. And eat off fancy miss-matched china for breakfast. And sew stars and stripes napkins to the fronts of my pillows. And hot glue cardstock stars (which I’ve had for eons) to some jute for a garland. And plop an old patriotic birdhouse on top of two crocks and a plate for a stand. And make patriotic rosettes. And sing the Star Spangled Banner and God Bless America. And recite the Pledge of Allegience with my hand over my heart. And humble myself and pray. That God would preserve this nation of ours, which once was great and make her great again. So we can really be a nation where people are free and justice reigns. A nation of people who really do make a difference in the world…feeding the hungry…freeing slaves…and bringing hope. So we can sing, I’m Proud to be an American and really, really mean it. Who knew that changing up a sunroom for a decor challenge could be such a patriotic thing? If you came to my house…what would be your favorite part of this over-the-top American flag, stars and stripes, sunroom? Now that you’ve been inspired. I hope you were. [wink] Are you going to do a little bit of decorating for freedom too? What’s your favorite way to celebrate the 4th of July? P.S. I enjoy your lovely and thoughtful words and read and reply to each one. If this post has inspired or encouraged you in any way, would you let your friends know with one of the sharing buttons at the bottom or side? Thank you! For more….visit these creative gals who revealed their One Room, Three Ways…. Your sunroom is always fabulous, but this is my fave (and Christmas) (and Valentine’s Day)…well, all of them are faves! I decorate the whole house for the 4th….but my bathroom has to take the prize! I decorate it every month for whatever the season or holiday is! It’s white, so I have all the towels and pretties to completely change it! But July is my favorite, partly because I start on Memorial Day and leave it up until the end of July. Hmmm…..I almost leave Christmas that long…….oh, I just love holidays, seasons and the great God who brings them! How fun that you decorate everywhere…including the bath! Haha!! I know exactly what you mean….each time I do something new I like it better than before. But…Christmas is probably still my fave!! *laughing* And here I thought I was the only one who decorated their bathroom. What a great make over–and you’ve kept that ‘cool’ feel to the room with the splash of stars and stripes, even in the corners. Like you, I’ve frowned at the fall decorum that’s already on the shelves. Not sure what the rush is, but I’m not joining it (even though I adore fall!). I’ve got lightening bugs to watch, barbeques to have and sidewalk chalk to play with yet! Goodness me, it’s JUST July! Lovely transition. I’m all about the wee birdie house–but the cherries made my mouth water!. I’ll be doing a tad more decorating outside on the patio where we’ll have the masses who’ll catch a bite here and there. Other than that–I think I’ve about called it ‘good to go’……at least until the girl shows up. *laughing* She’ll hang the lights and decorate the tables. Notsomuch fancy as yours–we’ll be doing paper plates and the ‘eat, toss and go’ with all the stuff that goes on in this wee community in celebration of Independence Day. Oh my….you are so sweet!! And I absolutely love that you are the entertainer extraordinaire!!! And my friend….I should hope that you would be using paper plates!! Haha!!! No doubt it will all be lovely! What beautiful, inspirational and festive Fourth of July ideas! Love the way you displayed the large flag. Beautiful blueberries… Have a safe and happy 4th and get those sparklers out! Mary Lise…you simply make me smile!!! Wishing you the happiest Fourth too!!! Happy Fourth to you, too!! Thank you so much Vel!!! Oh I bet your entry is stunning! In my kitchen/dining/living room combo, I put out red and white accessories from mid-May to mid-Sept, including my wonderful Longaberger baskets with patriotic liners. For Memorial, Fla, &Independece Days, I add flags in the room. I bet that your room(s) look fabulous!!! Can you share a photo on one of my FB pages? I’d love to see what you do and I’m sure others would too!! You are so sweet Michele! Thank you! Haha!! I actually walked in the sunroom this morning and thought….Oh NO! Did I over do it?!! Hi and Happy 4th of July. The room you decorated looks so nice. I saw it on kathe with an e.
How nice of you to stop by and leave your kind words! Best wishes for a spectacular Fourth!! You just made my day Sarah!! Thank you sooo much for your kind words!! what a great place to enjoy the 4th of July. Hope your day is happy and productive. What a lovely remark! Thank you ! I like the cherries in the Longaberger basket best! 😀 I have an inaugural basket I could have put out but I didn’t. I only decorated our kitchen and dining table because we’ll be out of town the rest of the week. My favorite way to celebrate the fourth is on Lake Martin, Alabama! My husband thoroughly agrees with you, Ricki Jill!!! And the best part…they are really really good, too! What a beautiful place to go. I hope your Fourth of July Celebration is Extraordinary!!! 😀 Thanks so much for linking-up to My Happy List. You made my day! Love your summer memories — so many we share, and love your patriotic sentiments too. I am PROUD to be an American and will sing it loud and proud when they play it in our little town’s old-fashioned gathering in a field on the Fourth! To answer your question, I love your wicker chair with the white matelasse coverlet and patriotic pillows. My mom and my grandmother always had antique white wicker on the screened porches and that just spells summer to me! Your room looks great, THANKS SO MUCH for sharing it today at Favorites on the First! Thank you for your thoughtful remarks and encouragements. Wishing you an Extraordinary Fourth of July!! How very patriotic! Love all that red, white and blue! No matter how you decorate that room, it looks like a lovely space to unwind! Happy 4th! Wishing you a spectacular Fourth!!! I had to do a double take 🙂 I have a flag bouquet in a milk glass too! Yours look wonderful!! 🙂 Your decorations are just beautiful! Gorgeous transferware with the blueberries! Came over from Confessions of a Plate Addict! That is too funny!! I must go check it out! Hope your 4th is Extraordinary! Love it! Great way to show your red, white, and blue spirit! I’m pretty much smitten with red, white, and blue…even having a Pinterest Board dedicated to that color combo! LOL!! Thanks Emily for your kind remarks! Your home is beautifuly decorated to honor Old Glory, I love it all! I’m in love with the basket with the cherries, it’s so heart warming. Hope you come and visit too. Enjoy your Fourth weekend ahead. Thank you Fabby!! My husband said the basket of cherries was his favorite too!! For some reason I never get around to decorating for the 4th, but seeing all your beautiful patriotic decor makes me want too!! Oh I do hope you take a few minutes to do a bit of decorating, Lisa! A few flags and some red, white, and blue everyday things can really put a smile on your face. Thanks for your kind words and for taking the time to stop by! You are so sweet Jolene….thank you for your kind words! Wishing you An Extraordinary Fourth of July! I think it’s all adorable but love all the flags the most. Have a beautiful 4th of July. Hope your Fourth of July is Spectacular!!!! Your sunroom is beautiful! It makes me want to sing Yankee Doodle Dandy and just take a sit and look around! I do decorate for the 4th of July. In fact I begin decorating for Memorial Day and keep it up through mid-July. I love Americana decorating. We are having homemade ice cream and sparklers! Wish you lived near so you could come enjoy the festivities at Still Woods. Oh Lynda…that sounds like a day full of memories in the making! A few years ago we had a big party and got out the old-fashioned crank ice-cream makers that were my parents….all the kids had so much fun turning the crank and enjoying that soft ice cream. It was great entertainment for everyone. Thanks for stopping by and for your wonderful warm and thoughtful remarks! Your patriotic decor is fabulous. I love everything you’ve done. Have a Happy 4th of July! Awwww…thank you Diane! 🙂 You are so kind. I decorated the front porch, a shelf in the dining room and put flags in the garden. I particularly love the star runner you have hanging off one piece of furniture and you can’t go wrong with flags everywhere. Our 4th of July is the same as every year – BBQ at the ocean front house on our lane, I will make homemade chocolate chip cookie ice cream sandwiches ( I didn’t on Memorial Day and people were unhappy with me) and we will follow up with fireworks on the beach. It is a tradition we love. Everything sounds so festive Carol! And a BBQ with neighbors and friends is such a wonderful tradition…what a lovely blessing. Homemade Choc Chip ice cream sammies….oh my!!! I bet those are a huge hit!!! My mouth is watering just thinking about how good that must be. Thanks for popping over and leaving your sweet words! Wishing you and yours a spectacular Fourth!! Your home looks charming and I like the basket of cherries! And those cherries are almost all gone!! Boy they were good!! Thanks for the sweet compliment, Sandi! You have done a great job with all your Patriotic decorations on your sun porch! Very creative. The basket of cherries look great and delicious. Thanks for sharing and have a wonderful 4th. Awwww….you are so sweet Carol! Thank you!! Oh yes! I want to come and do all those fun things with you today…..on your pretty porch! Oh Martha! That would be so fun!! Hope your long holiday weekend is Extraordinary! The cobalt glasses came from BigLots of all places about 10 years ago. I’m amazed I still have all 14! Your sunroom is wonderful and I love it decked out in flags and r,w&b!! Thanks for joining TTF this week. I must say I LOVE walking past the sunroom all decked out in patriotism. My face lights up every time. Thank you Linda for your sweet words. Hope your holiday weekend is Extraordinary! Wow I love it all! Thank you for sharing at One More Time Events. Awwww…you are so sweet Tammy. Thank you!! So charming and patriotic…love your 4th of July room! Love your baskets and the milkglass full of flags!!! Thanks soooo much for sharing at AMAZE ME MONDAY!!! So pretty and patriotic! I love red, white and blue for the summertime! I use lots of flags in decorating too! Thanks for your lovely remarks Sharon!! Wishing you a new week that’s truly extraordinary!! Diane, So well said! I love your sun room , that is exactly where I’d like to hang out and eat cherries 🙂 And of course your Longaberger baskets always catch my eye . Thanks Kathy!! I must say those cherries for delicious, too! Thanks for popping by and for your lovely remarks! Awww…thank you so much Kathy! 🙂 Maybe it’s the pop of red to our love of blue and white that makes it sing. Yes? It’s a joy to participate in your party. I love it when Longenberger and transferware come out in the decor design. You made your room look amazing! Awww…Becky…you just put the biggest smile on my face! Thank you soooo much! just beautiful, the simple elegance of that milkglass piece with the flags really wowed me, thanks so much for joining in! That piece of milk glass is the base to a covered compote that my parents got for a wedding gift in 1950. It’s the first time I’ve used it for anything. Thanks for noticing, Debra! Wishing you An Extraordinary Day! Thanks Lynaea for popping my and encouraging me with your lovely remarks. Great job, Diane! What a great room, too. It looks perfectly patriotic! Awwww….thank you soooo much, Kathy!! Wishing you an Extraordinary week! !